Imagine with me if you would, a math program that targets the particular needs in a given students math journey. Enter in A+ Interactive Math with their new Math Mini-Courses, of which we reviewed Elementary Geometry and Elementary and Middle School Division. These math lessons worked well. 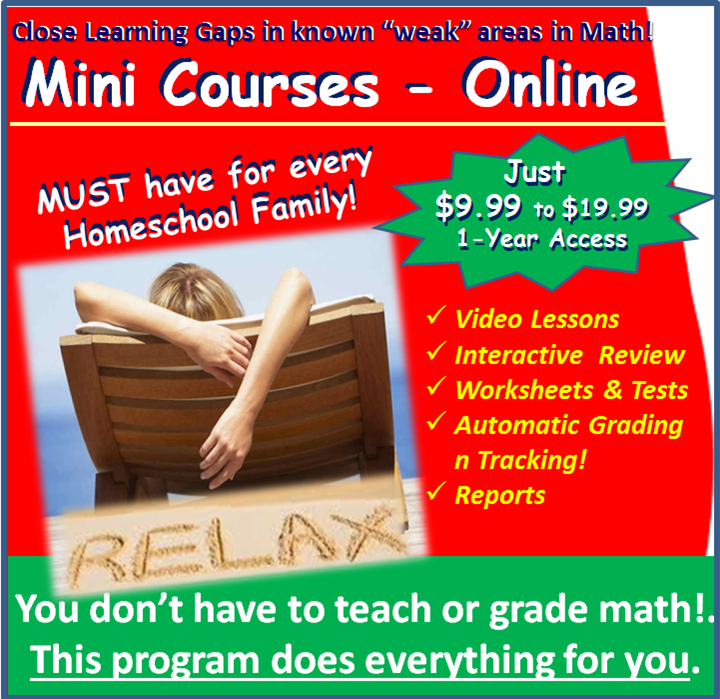 Having reviewed A+ Interactive Math a couple of times in the past, i was pretty sure what I could expect with these courses, and expected initial enthusiasm from my son which would quickly wane as he found things about the course that he didn't like. To my surprise, I didn't run into this at all with the 19 lessons he took in Elementary Geometry. I even received comments of "Mom, this is easy", "Mom, is it time to do my math yet?" Or "Mom, all I have left to do is math right?". You have to understand something.. math is NOT high on my son's list of priorities AT ALL, so to have positive comments from him or even eagerness to finish his math lessons is simply a delight. How doesA+ Interactive Math work? After inputting your students password they are greeted with this page. It took my boy only two reminders to use the Launch button. This would open the mini course in a new window. The window opens landing on this page with interactive buttons directing the students to their next stop. My son always clicked on the video lessons. Video lessons brings you to this page, where it is important to click on the file folder which opens up each lesson. It won't open up the next lesson until you close out the previous lesson. At the end of each lesson you need to mark off the box at the top of each lesson saying completed. One of their neat features is the ability to view the lessons as PDF's. I had my lad do this for one lesson. He liked that he could read it himself but found the interactive lessons much quicker to go through and he remembered the information better for the quiz that follows each lesson. (as evidenced by the 75% in lesson three). If you choose to let your child do the on-line worksheets, they are easy to generate and are listed by topic title as per the lesson page. These same quizzes and tests are also available as PDF's. I was glad to see that option. The answer guides are included. They have done such a great job in making sure that each student can learn in the way best suited for them. When a lesson is completed this page will be shown, giving the results of the quiz. If you want to you can print off a certificate. My son never chose this option saying "Mom, it's wasting paper, I know I did it". Isn't it nice though to have that option? These mini courses are great. They close learning gaps in math for students in an interactive way that grabs their attention. My son is much more confident in his geometry skills than he was previously. He did work briefly with the division program as I asked him to do so, but preferred to focus his attention on geometry. He found the division courses as step by step as the geometry one. We are considering adding these mini courses as he finishes these two. My thoughts are this: if you want to cover the gaps, or just have a short lesson of key concepts, these mini courses are just the ticket. Short enough daily lessons covering the main concepts of any given math subject area with a quiz to reinforce learning. It certainly worked well with my math-unfriendly lad and i couldn't be more pleased. Received: Math MIni-Courses in Elementary Geometry and Elementary/Middle School Division. Length: Access for one year. Delight-filled cries of "WOW...Mom, come see this"! We've been using Rainforest Journey , a fun online science program from EdTechLens as part of our school day. Our focus has been on grade five materials. EdTechLens is a life science program targeted at the Kindergarten through grade five levels. This is an on-line science program for elementary aged children. Their delight is in creating supplemental programs that are creative and engaging for their students. They want to help students learn as much as they want to help teachers track what their students are doing. When you sign up you will have a teacher page, and each of your students will have their own page. On the teacher page you will find a host of materials to help you with your students. On your page you will find such help as managing your class, hands-on activities, course outline, how to teach and the pedogogy of the course. For my student his start up page looked like the picture below. As you can see five units of study. The primary sources section has a large number of videos (as does the blog) as well as interviews with the various team members. Each unit of study is further broken into chapters and assessments. You can set up the class so the student can do the course in whatever order they want OR that they have to complete one set before they can move on to the next. As you can see my son mostly does the lessons in order, but occasionally skips ahead. He can easily see which lessons he's completed, and which ones he has yet to do. One of the interesting things about the program is how multi-faceted they have made it. They have audio options. As well as the option of printing off the entire lesson as a PDF. Each lesson has a quick question answer review. It has so many little options to make it a really handy program. One of the quirky things my lad commented on...the audio program spoke too slowly and wasn't the same as the written version. How did my son use it? He did one lesson a day, usually right after breakfast, sometimes before depending if it took me longer than usual to come in from doing chores. He would tell me what he learned about and we called it a day. I actually didn't even KNOW there were unit reviews until I did up the pictures for the review because well.. he never told me and I trust him to do his lessons. Has he done them? Haven't the foggiest, but does he know the material? Yes, so to me.. it's all good. What did my son think? The photography is stellar. It was really neat to see the clear, concise images. My lad particularly enjoyed the animals, and on the odd occasion we'd look up more information up about them. They had so many photos as part of this science program. It was really good to see them as pictures are so worth a 1000 words. It was an excellent opportunity to good photography of the Rainforest biome. I loved how my boy would say, when I came in, things like "Mom, come see this... isn't this caterpillar funny"? I particularly like that it's a safe program that has a logical run to it. Each lesson follows a similar format. Each lesson builds on the one before it. In a nutshell what do I like about Rainforest Journey? My son seemed to enjoy it. He learned a few things (which is the point right?). He has no hesitations about loading it up and doing it, it worked equally well in all browsers and computers. I like the dual formats for doing lessons.. so if you can't do it at home and want to take a lesson on the road.. just print and go. They make it so easy. Great photography along with audio if you don't feel like reading. For how we used it, it is a great program and I'd happily recommend anyone else use it. :) I plan to have my son finish out the journey. Type: Supplemental Digital Science Program. ﻿EdTechLens﻿ can be found on Social Media. The TOS Crew will be doing an "apps" round up this week, and I got to thinking.. wouldn't it be fun to share some of my son's fun with the art apps we have on my tablet? So with no further ado.... Art in the hands of one 10 year old boy. Each of these apps come with a variety of writing textures and styles that one can use. They have a different focus, being more for drawing, or photoshopping pictures or whatever. They help expand ones creative endeavors without having to do a lot of erasing or do-overs that make you feel like you've wasted your time. We are both continuing to refine our skills. My son's favourite app hands down is the one that came with the tablet. It is called S-Note and he has SO MUCH FUN with it. He makes his own pictures. Takes pictures with the camera and then alters them. He's learned how to minimalize his pictures, reverse, and all sorts of things. It's just another fun thing to do. His next favourite is Sketchbook. It is quite similar to S-note which is why I think my lad likes it. It is just as intuitive for him to negotiate. He had a lot of fun turning his cat into a warrior cat. I am not sure the Milo was too impressed though (he ran off when the lad showed him the picture). Art Rage is the app that I happen to like the most, but my son has yet to develop an appreciation for. it has a different feel to it and he is having hard figuring out exactly how to use it well. This post will be part of the roundup on the crew blog. It will go live on Jan. 22. You can find it HERE. I am also linking up this week with Blogging through the Alphabet. You can find us over HERE doing the Letter L.
A recent review I did for a book called Secret Coders had me wondering if there were online sites for teaching children how to code. Learning HTML for kids. This tutorial attempts to teach the young (10 years old and up) about the markup language HTML. I have tried to present the information in the simplest of terms so that it can be easily digested. 12 chapters of information for children to work though. Geared for children 10 years + with the ability to use a browser. Kidscodecs. Kids, Code, and Computer Science magazine is a bi-monthly online and print magazine about learning to code, computer science, and how we use technology in our daily lives. The magazine includes hard to find information, for example, a list of 40+ programming languages for education, coding schools, summer tech camps, and more. Secret-Coder.com. Learn how to code in Logo, a binary number system of programming. Worksheets, videos and more. BlueJ, a professional Java development tool with a simplified interface for beginners. Hackety-Hack.teaches the absolute basics of the Ruby programming language. Ruby is the foundation of many desktop and web applications such as Twitter, Shopify and Hulu and is a great starting point for command based programming. Students use an integrated text editor to begin building ruby apps and by the end will be comfortable with basic programming syntax. Udacity has a computer programming course as well. Pluralsight has HTML, C+ and other courses as well. Scratch for children 8-16. Developed by the MIT Media Lab, Scratch is a visual programming language. It allows students to build interactive stories, animations, games, music, and art. Full video courses on computer programming. Computer Science Programs from OpenClassrooms. Full courses. Short Videos. Free for everyone. These programs should get your children started in their computer coding. Perhaps your child will develop the next hit game or the next great homeschool help? Wouldn't that be cool?